Since their discovery in 1977, the evolution of conducting polymers has revolutionized modern science and technology. These polymers enjoy a special status in the area of materials science yet they are not as popular among young readers or common people when compared to other materials like metals, paper, plastics, rubber, textiles, ceramics and composites like concrete. Most importantly, much of the available literature in the form of papers, specific review articles and books is targeted either at advanced readers (scientists/technologists/engineers/senior academicians) or for those who are already familiar with the topic (doctoral/postdoctoral scholars). For a beginner or even school/college students, such compilations are bit difficult to access/digest. 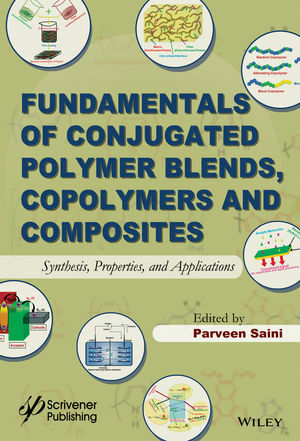 In fact, they need proper introduction to the topic of conducting polymers including their discovery, preparation, properties, applications and societal impact, using suitable examples and already known principles/knowledge/phenomenon. Further, active participation of readers in terms of “question & answers”, “fill-in-the-blanks”, “numerical” along with suitable answer key is necessary to maintain the interest and to initiate the “thought process”. The readers also need to know about the drawbacks and any hazards of such materials. Therefore, I believe that a comprehensive source on the science/technology of conducting polymers which maintains a link between grass root fundamentals and state-of-the-art R&D is still missing from the open literature. Parveen Saini has been a scientist at the National Physical Laboratory, New Delhi, India since 2004. He obtained his PhD in Polymers and Engineering from the Indian Institute of Technology, New Delhi, India, and thereafter, he worked as an engineer at the Sriram Institute for Industrial Research, New Delhi. His research interests include conducting polymers, carbon nanotubes, graphene, conducting polymer nanocomposites for electromagnetic interference (EMI) shielding, microwave absorption, antistatic/electrostatic dissipation (ESD), anticorrosive, and battery applications. He has authored more than 50 scientific publications, book chapters, and patents. He is the recipient of the prestigious CSIR Young Scientist Award-2013 in the area of Engineering Science.